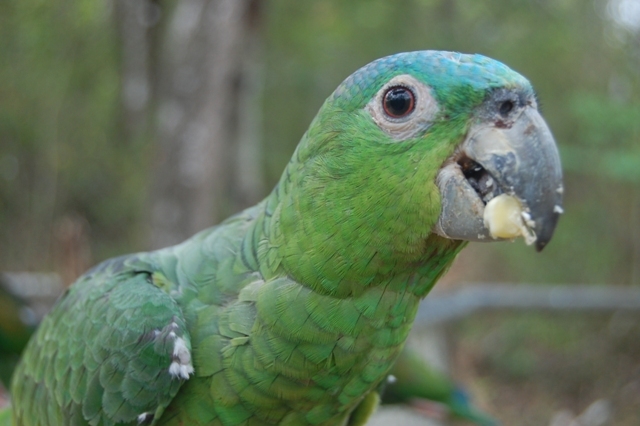 Mealy parrots are the largest of the Amazonas (38 – 41cm in length) found on the Osa Peninsula of Costa Rica. They are distinguished from the Red-lored parrots by the absence of the red markings on the forehead and their large white eye ring. Most amazons can be aggressive but the mealy parrots have a docile temperament and are considered to be the gentle giants of the amazon parrots. They are found from South Mexico down through Ecuador, Bolivia and Brazil, but its population has declined in its range due to loss of habitat and other human induced pressures. 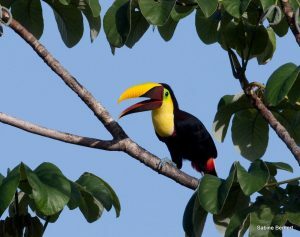 It is a common to abundant resident of the Osa Peninsula often seen in forest canopy or semi-open areas near forest cover. In the breeding season they are generally found in pairs or small flocks of 15 to 20 individuals, however, winter roosts have known to contain more than 100 parrots. Mealy parrots can be raucous in flight but very quiet while feeding unless there are some demanding youngsters around! Their diet consists of fruits, seeds, arils, buds and flowers and they are known to feed on human crops such as corn as well. They love to climb and hang around upside down during the day. They nest in natural cavities and can lay 3 – 4 eggs in a breeding season. The female incubates the eggs for 24 – 28 days and is fed by the male through regurgitation until the eggs hatch. He will help feed his nestlings until they leave the nest at about 8 weeks. Its call is a series of deep squawks. 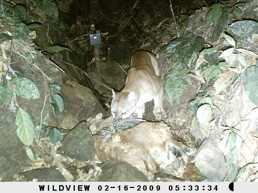 When most people wander through a tropical forest, they are awed by the diversity and abundance of plants, mammals and other members of the forest community they see. While biodiversity is certainly a fantastic feature of tropical landscapes, my interests lie on the darker side of the ecosystem. Don’t worry, I’m not talking about the force – I’m talking about the soil! 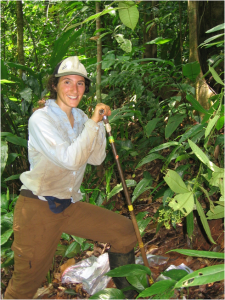 For an ecosystem ecologist, one of the most fascinating aspects of tropical ecology concerns how tropical forests are able to maintain high levels of productivity and diversity over extensive periods of geologic time. Many tropical forests are located in areas of the globe that have had stable climates for millennia. While this has enabled the evolution of tremendous diversity of life forms and complex relationships between organisms, it also means tropical soils, the foundations of the forests, are old, deep and highly weathered. Tropical soils are a dynamic and largely unexplored facet of the tropical landscape. How are nutrients transformed as they move through the soil matrix? What enables the maintenance of high productivity in sites with soils depleted in elements critical to life, such as phosphorus? How do hydrology and topography intersect to control nutrient retention and nutrient export from tropical watersheds? How does this affect the biota, and how do biota in turn affect elemental cycling? These are some of the questions I and my fellow lab mates are exploring as part of our dissertation research under the advisorship of Dr. Alan Townsend. I’m part of the INSTAAR Biogeochemistry Lab at the University of Colorado, Boulder, and we are here in Costa Rica conducting research on a National Science Foundation (NSF) grant. I’m currently at the Osa Biodiversity Center (OBC) with three of my colleagues from the Townsend/Cleveland (University of Montana) labs for one week, conducting the first of a series of experiments testing hypotheses about nutrient transformations along hydrologic flow paths in a pristine rainforest catchment. Today, along with the invaluable assistance of a local research technician, Walkom Cabrera, we sampled three distinct topographic positions along a soil catena. We extracted soil cores up to a meter below the surface, and measured nitrous oxide (N2O) emissions from surface soils from the same locations. This may be easy to say, but hard to do! Soils down to a meter are extremely dense, and we used a mallet to pound our soil cores into the earth. It was hot, sweaty work, but we managed it. Back at the OBC, we spent the evening extracting dissolved nitrogen (N) compounds from the soil samples using a concentrated salt solution. 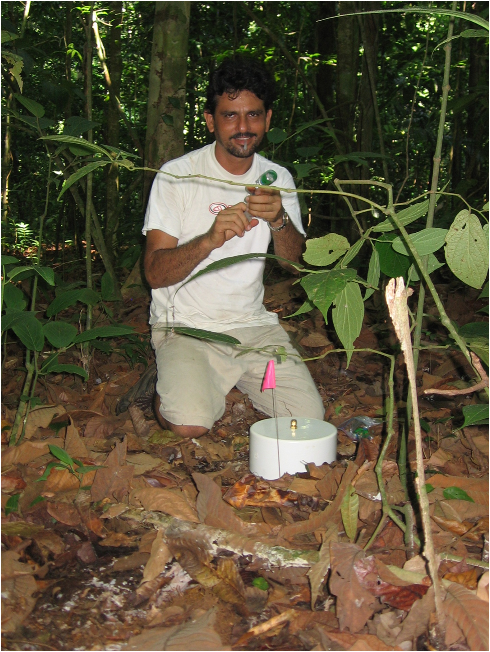 At our laboratory in Boulder, I will further analyze properties of these soils that will elucidate controls over nutrient transformations within the deep soil profiles of this dynamic tropical forest. The findings of this research will help us understand the role tropical forests play in the cycling of critical nutrients important for global climate and energy balance. And studying the biogeochemistry of this amazing place does have its perks. Howler monkeys are my favorite alarm clock, sunsets at Piro beach set the sky on fire, and the macaws are never out of sight (or hearing for long). Conversations at dinner with conservation biologists, herpetologists, ethologists and nature enthusiasts are illuminating and exciting. I’m anxious to analyze the results of all this hard work, and can’t wait to return for my next visit to follow up with more interesting questions surrounding tropical biogeochemistry here on the Osa Peninsula.